We’ve had ants in this apartment ever since we moved in. Our househelper says it’s because we are on the second floor and surrounded by trees. I think she’s right. She also pointed out that the apartment below us has been vacant this whole time, so all manner of bugs are probably having a heyday down there and using it as the base of operations for expanding their reign of terror into the rest of the building. Okay, that’s paraphrasing and elaborating from the Mandarin, but whatever. It made me think of all the cockroaches, ants, and spiders that are living the good life right below our feet. Not exactly the kind of happy thought that will help you fly, Wendy. Anyway, until four days ago, we only found ants in the back bedrooms or on the back balcony, where they seemed to just accidentally come trooping through the room on their way to somewhere else more interesting. We would sweep them away and that would be that. It was quite manageable. Well, find the kitchen they finally did. And they certainly have been much harder to get rid of. I found three or four lines of ants going up and down the south wall of our little kitchen. After moving stuff around, I found what had drawn them in. 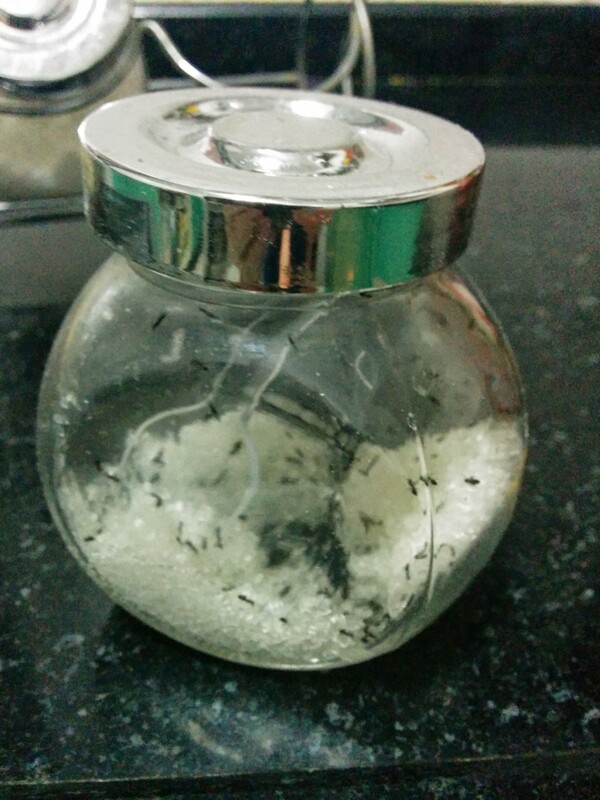 Our sugar bowl, which has a screw top lid that I thought ants could not get into. They also got into another lidded jar that had the remains of precious powdered sugar, and into a bag of brown sugar that was clipped shut. Ugh. Eric and I spent a long time spraying things with vinegar, wiping down the ants and their trails, dumping out the sugar and cleaning up everything. I also tried to make sure there wasn’t anything else they could get into, and thought we were done. More spraying and wiping and sweeping and such. There, that should fix them. I was pleased as punch to wake up in the morning and see an ant-free kitchen. Finally, I thought. Then I walked into the dining room. They were swarming all over our little sideboard and coffee cart. Stink. It took me a long time to figure out what exactly they were getting into. They were on our coffeepot (“Oh great, they’re caffeinated,” my son joked), our blender, and one of the chairs. I suppose all those things may have had some kind of food residue, but didn’t seem enough to explain the hundreds of ants we were seeing going across the wall and floor. I finally realized we had a box of sugarcubes stored by the coffee and tea. I opened it up and found the inside covered with ants. Yup, that seemed to be the attraction. More cleaning and swiping and drowning ants in the sink along with the sugarcubes. 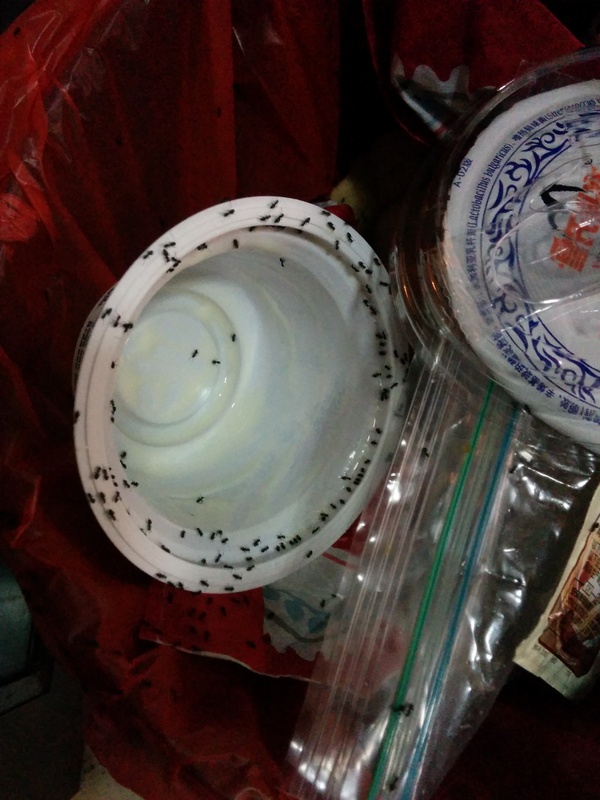 We had friends over for dinner, and I lamented to one of them about the ants. By this time, there was hardly any trace of the fiends. We set three bottles of soda on the sideboard during dinner. Sometime during after-dinner coffee, my friend looked up and exclaimed, “Emily! Ants!” They were swarming on the soda bottles. Quick little buggers. More battling and cleaning. I’ve learned my lesson and knew when I woke up this morning that the ants may have found something new to attack. And they sure did. 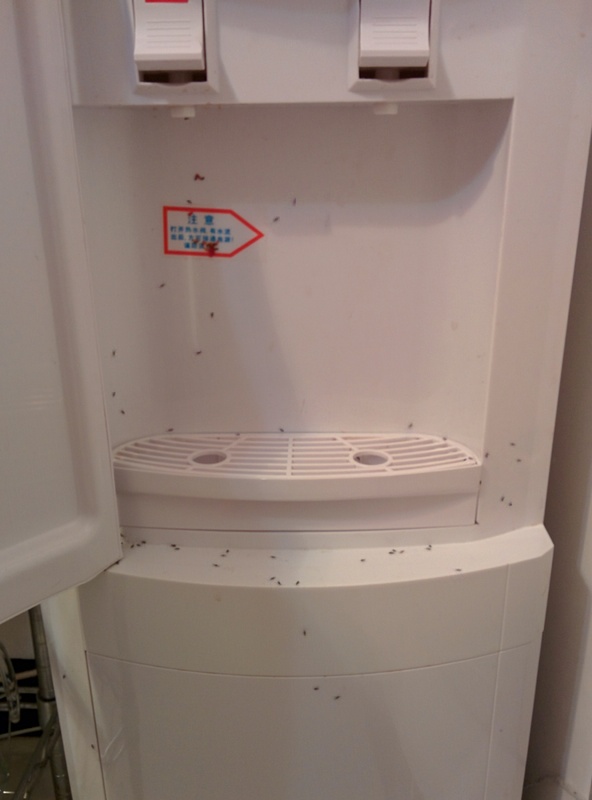 I found them all over our water dispenser. Really? Water? But there they are. More spraying and wiping. At lunch, the floor under the table was suddenly covered with them. “Oh, yeah, there was like a little crumb of pancake there after breakfast,” my son reported, “but I cleaned it up. Maybe there’s just some residue?” These are some lihai ants, people. After lunch, my daughter set her empty cup down, and about 10 minutes later, it looked like this. It’s bedtime now, and I’ve checked and re-checked everything, and moved furniture, and tried to wipe and sweep and clean all I can. It looks like the coast is clear, but I don’t know what the ants will be up to while I sleep. I don’t know how long this battle will be waged, but I do know one thing: if I ever want to take over the world, I’m going to recruit ants for my evil, unstoppable army. I’m sorry about your ant infestation. 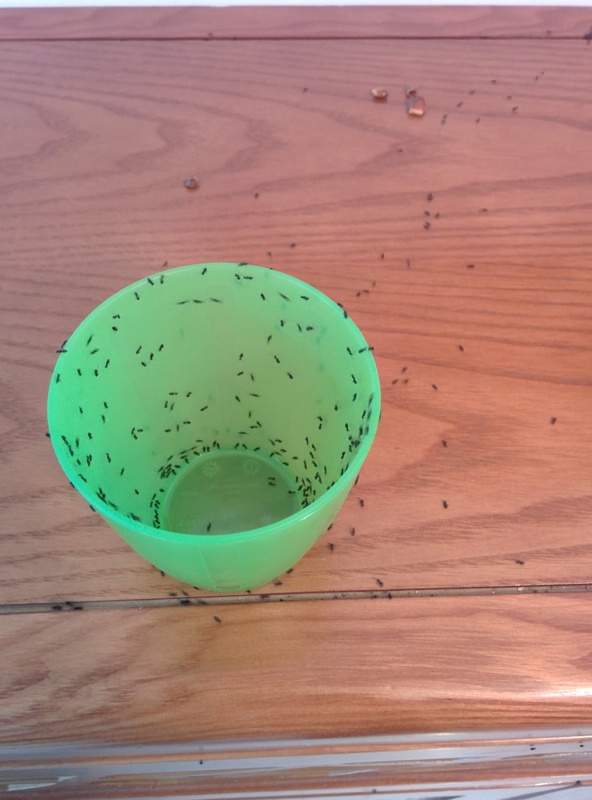 We had ants once and we found out the best way to get rid of them is to use bait. They take it back to the “queen” and it kills off the colony. Not sure if there is bait out there, but you might be able to find homemade recipes online. We also used baking soda. We figured out where the ants were coming from and put a line of baking soda there and supposedly they see it and turn back around. We haven’t had ants since. Not sure if it’s a coincidence. But, I hope that you can find a solution soon! Thanks, Anne. We are having a hard time figuring out where exactly they’re coming in. The construction of these apartments leaves lots of cracks and seams where they can sneak in. Eric tried making homemade bait, and they were eating it for a while, but they were more interested in all that sugar! Thankfully, there are no ants so far today. Well, at least not in our apartment. There’s a big line of them downstairs, outside the building. I’m sure they’ve moved on to someone’s else’s apartment for now. We’ll be sure to keep our sugar locked up tight, and our trash emptied overnight. You’re living my life. Have you thought about moving? Just kidding. Or am I? I don’t know what to do anymore but I am so annoyed. Ants crawling up my arm when I am cooking. Not what dreams are made of. UGH. I am so sorry about your ants. Our “solution” really was to move!